A graph representing the aggregate demand at each level of a country's GDP. On the aggregate demand schedule, the x-axis represents GDP and the y-axis represents aggregate demand. In general, aggregate demand (the overall demand in an economy for goods and services at a certain price) rises along with GDP. Fig. 4 Aggregate demand schedule. (b) Shifts in the schedule because of determining factor changes. For example, if there is an increase in the PROPENSITY TO CONSUME, the consumption schedule will shift upwards, serving to shift the aggregate demand schedule upwards from AD to AD1; a reduction in government spending will shift the schedule downwards from AD to AD2 . (c) The graph plots the quantity of real national income demanded against the price level. (d) Shifts in the schedule because of determining factor changes. For example, if there is an increase in the propensity to consume, the aggregate demand schedule will shift rightwards from AD to AD1; a reduction in government spending will shift the schedule leftwards from AD to AD2 . Fig. 4 Aggregate demand schedule. 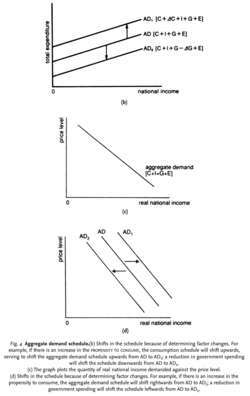 (a) The graph shows how AGGREGATE DEMAND varies with the level of NATIONAL INCOME. a schedule depicting the total amount of spending on domestic goods and services at various levels of NATIONAL INCOME. It is constructed by adding together the CONSUMPTION, INVESTMENT, GOVERNMENT EXPENDITURE and EXPORTS schedules, as indicated in Fig. 4 (a). A given aggregate demand schedule is drawn up on the usual CETERIS PARIBUS conditions. It will shift upwards or downwards if some determining factor changes. See Fig. 4 (b) . drawn on the assumption that other influences on spending plans are constant. It will shift rightwards or leftwards if some determining factors change. See Fig. 4 (d) . This version of the aggregate demand schedule parallels at the macro level the demand schedule and DEMAND CURVE for an individual product, although in this case the schedule represents demand for all goods and services and deals with the general price level rather than with a particular price. Therefore, the introduction of price-indexed bonds will result in a less elastic aggregate demand schedule. The aggregate demand schedule shows that, ceteris paribus, as prices increase, the quantity of goods and services demanded in the aggregate falls. Does the aggregate demand curve suffer from the fallacy of composition? Comparing the Bretton Woods regime with the float, we observe that the aggregate supply schedule became steeper under the floating exchange rate but the aggregate demand schedule became more flat.